You probably paid at least a few hundred dollars for the lens mounted on your dSLR right now. How would you like to play with a “lens” that costs you, maybe, five bucks? Now you, too, can turn your digital SLR into a pinhole camera. If you come to digital cameras from the film world, you might be way ahead. You likely experimented with pinhole cameras when you figured out exactly how cameras produce images. You can also use digital cameras as pinhole cameras. All you need is a pinhole! 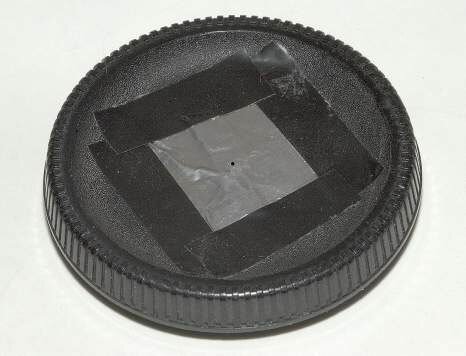 An easy way to create a pinhole “lens” is to poke a hole in a body cap and attach it to your camera instead of a lens. (You might have to buy a real body cap if your camera came with a cheap plastic translucent cover instead.) The body cap already has a flange that fits your digital SLR’s lens mount. Find the center of the cap and cut a hole in the center. You may end up cutting a hole that’s too large: The smaller and more precisely you make your pinhole, the sharper your pictures. So, cover the hole you made with a piece of metal. Then poke a tiny hole in the metal. You can use a piece of aluminum foil pierced with a sewing needle, and you can use a piece cut from a cookie sheet or other thin metal. The thinner the metal, the better. If you have a hobby hand drill that includes tiny bits, you can probably cut a precise hole in the metal sheet. Experiment with several different sizes until you get one that produces the sharpest image. After you mount your pinhole lens, you can look through the viewfinder and see a fuzzy, dim image. If you have extension tubes, try mounting one between your camera body and your pinhole lens to change the focal length of the lens. The f/stop of the pinhole is so small that you don’t have to worry about focusing after you establish the correct distance away from the sensor to mount the pinhole. Virtually everything is in focus. Of course, your aperture is so small that you have to mount the camera on a tripod and shoot time exposures, even in bright daylight. The figure shows an image exposed for three seconds at f-whatever, using a pinhole rig. 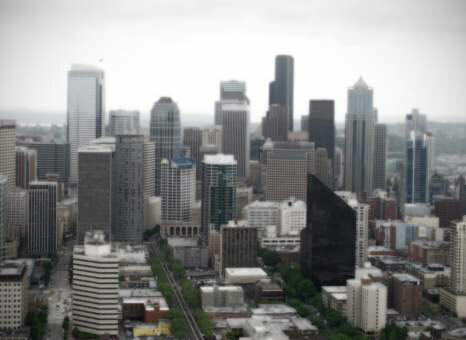 Use manual exposure to make pinhole pictures. If you’re using your camera’s meter, you might need to cover the viewfinder eyepiece to keep extraneous light from venturing inside and affecting the metering system.